More than two thirds of Hollywood's Best Picture winners were inspired by literature, whether it be a novel, biography, play, or short story. In fact, since the inaugural Academy Awards in 1928, more than 60 Best Picture winners derive from literature, and that's not including the nominees. From epic war stories to classic romantic comedies, here's a look at the lit behind Hollywood's most beloved films dating back to 1928. Based on the play, In Moonlight Black Boys Look Blue by Tarell Alvin McCraney, this coming-of-age film was nominated for eight Academy Awards and won three, including Best Supporting Actor and Best Adapted Screenplay. The movie itself was not based on a book but it is not without a literary connection. In the award-winning film, a desperate actor (Michael Keaton) attempts to boost his flagging career with a stage adaptation of Raymond Carver's short story collection What We Talk About When We Talk About Love, which was originally published in 1981. Solomon Northup was a free man who was kidnapped and sold into the Louisiana slave trade. He detailed his experience in his 1853 memoir Twelve Years a Slave, the basis of the film that won three Academy Awards. This Oscar winner starring Alan Arkin and Ben Affleck is based on the non-fiction read Argo: How the CIA and Hollywood Pulled Off the Most Audacious Rescue in History by top-level CIA agent Antonio Mendez. Published in 2012, Mendez's book details the complex rescue of six Americans from a hostage situation in Tehran in 1979. Other Best Picture winners from this decade were Spotlight (2015), The Artist (2011) and The King's Speech (2010). One of the most talked about movies of its time, Slumdog Millionaire is based on Indian diplomat Vikas Swarup's first novel, Q & A, the story of a young Indian boy who was accused of and imprisoned for cheating on a quiz show. The film won eight Oscars including best adapted screenplay. Author Cormac McCarthy is no stranger to the film industry. Four of his 10 novels have been adapted for the big screen, but No Country for Old Men, the story of a Texas drug deal gone wrong, is his only book-to-movie to win an Oscar for Best Picture. Million Dollar Baby is a short story by F.X. Toole, a pseudonym for Jerry Boyd (1930-2002), a fight manager and "cut man" (someone who stanches the bleeding of a fighter's wounds between rounds). The Oscar-winning film was adapted from Boyd's short story collection, Rope Burns: Stories from the Corner, which he wrote at the age of 69. J.R.R. Tolkien's work is ideal for film, and clearly The Return of the King, the third book in the Lord of the Rings trilogy, is no exception. The film adaptation won a whopping 11 Oscars, winning each category it was nominated in. Russell Crowe stars as Nobel Prize winner John Nash in the film adaptation of Sylvia Nasar's biography of the mathematician, A Beautiful Mind. 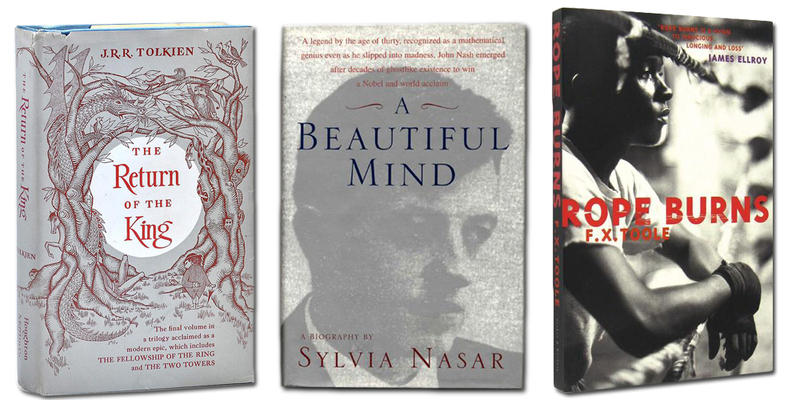 Those interested in the story of John Nash should follow Nasar's book with The Essential John Nash written by Nash himself. The Hurt Locker (2009), The Departed (2006), Crash (2005), Chicago (2002), and Gladiator (2000) also won Best Picture awards. Who better to star in a romantic comedy than William Shakespeare? While this charming Gwyneth Paltrow movie isn't exactly based on Shakespeare's writing, it does portray Shakespeare (Joseph Fiennes) writing Romeo and Juliet. That's literary enough for us. Based on Canadian writer Michael Ondaatje's novel The English Patient, this film was nominated for 11 Oscars and won nine. The novel won the prestigious Booker Award when it was published in 1992. Even the most avid readers aren't likely to know The Actes and Deidis of the Illustre and Vallyeant Campioun Schir William Wallace, but they might be familiar with its English translation, The Acts and Deeds of the Illustrious and Valiant Champion Sir William Wallace, also known as The Wallace, an epic poem written by 'Blind Harry' in the fifteenth century. The historic poem was the basis for the Mel Gibson film that won five Oscars. An adaptation of Winston Groom's 1986 novel of the same name, Forrest Gump won six Oscars. Tom Hanks won the Oscar for Best Actor for his portrayal of Groom's beloved title character. Schindler's List is adapted from Australian author Thomas Keneally's Booker-winning novel, Schindler's Ark (later released as Schindler's List). Keneally's work is a fictional account of Nazi Party member Oskar Schindler's involement in saving hundreds of prisoners from concentration camps. While credit was never official, Unforgiven screenplay writer David Webb Peoples was inspired by Glendon Swarthout's 1975 novel The Shootist. A classic western tale, The Shootist won the Spur Award and has been called one of the best western novels ever written. 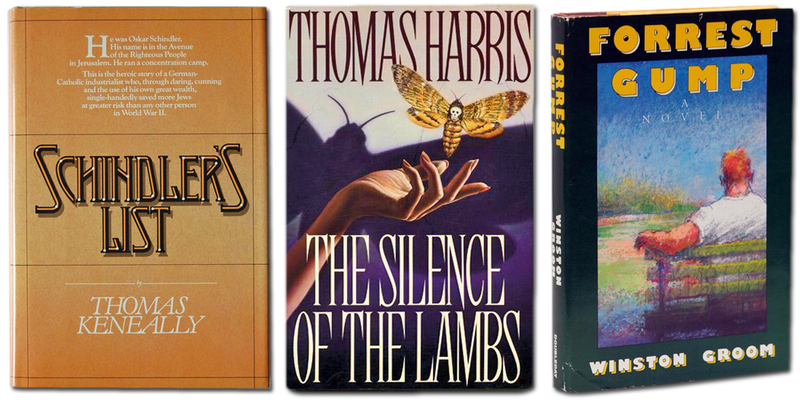 Based on the novel The Silence of the Lambs by Thomas Harris, the movie of the same title won five Oscars, including Actor and Actress in a Leading Role. The legendary Anthony Hopkins won the award for his portrayal of cannibalistic serial killer Dr. Hannibal Lecter, while Jodie Foster won for the role of Clarice Starling, the young FBI student sent to interview Hannibal. Based on the 1988 Civil War novel by Michael Blake, Dances with Wolves was produced and directed by Kevin Costner, who also happened to star in it as Blake's main character, Lieutenant Dunbar. The '90s also gave us Best Picture winners American Beauty (1999) and Titanic (1997). The Oscar-winning film starring Jessica Tandy as Miss Daisy and Morgan Freeman as her driver Hoke Colburn is based on the play Driving Miss Daisy by Alfred Uhry. The film Rain Man was inspired by Kim Peek, an American savant. Peek's story is documented in the book The Real Rain Man: Kim Peek by Fran Peek. Dustin Hoffman was awarded the Best Actor Oscar for his portrayal of Raymond Babbitt, a fictional Kim Peek. Based on the book The Last Manchu: the Autobiography of Henry Pu Yi, Last Emperor of China by Kuo Ying Paul Tsi, The Last Emperor won nine Academy Awards, winning every category it was nominated in. Based on Danish Baroness Karen Blixen's 1937 memoir Out of Africa, the film starred Meryl Streep and Robert Redford. Out of Africa was nominated for 11 Oscars and won seven. Adapted from screenwriter Peter Shaffer's own play, Amadeus, this period drama accounts the fictional lives of Wolfgang Amadeus Mozart and Antonio Salieri. The film won eight of 11 Oscars. 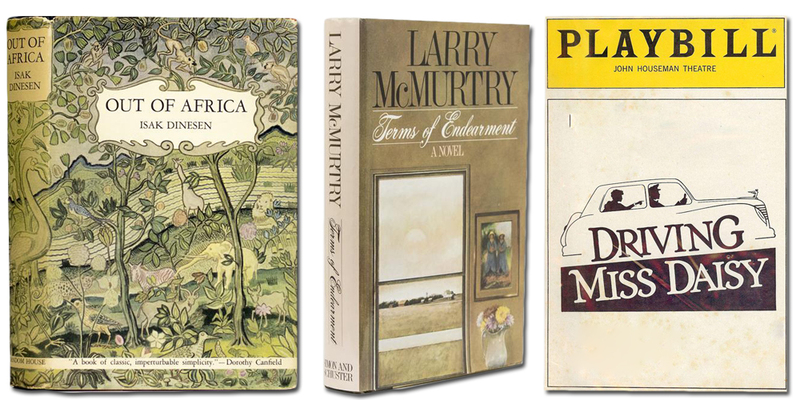 John Lithgow, Jack Nicholson, and Shirley MacLaine all starred in the film adaptation of Terms of Endearment by Pulitzer Prize-winning author Larry McMurtry. MacLaine won the Oscar for Best Actress for her portrayal of McMurtry's memorable character Aurora Greenway. Based on Judith Guest's novel Ordinary People, this adaptation was Robert Redford's directorial debut. The novel was Guest's first, too. Platoon (1986), Ghandi (1982), and Chariots of Fire (1981) were the big award winners of their year. Based on the 1977 novel Kramer vs. Kramer by Avery Corman, this Best Picture winner starred Dustin Hoffman as Ted Kramer and Meryl Streep and Joanna Kramer. Their portrayals earned them each an Oscar. Based on Ken Kesey's classic 1962 novel One Flew Over the Cuckoo's Nest, this film won five Oscars including best adapted screenplay. Jack Nicholson took home an Academy Award for his portrayal of Kesey's violent convict Randle McMurphy. Author Mario Puzo co-wrote the screenplay for The Godfather Part II, based on his epic family saga The Godfather. He shared the Oscar for best adapted screenplay with Francis Ford Copppla, who also directed. Winner of seven Academy Awards, The Sting is based on the non-fiction book The Big Con: the Story of the Confidence Man by David Maurer, a professor of linguists who specialized in con-man argot: the write, the rag, the payoff, ropers, shills, the cold poke, the convincer, to put on the send. The film that arguably launched Al Pacino's stardom was based on Mario Puzo's The Godfather, published in 1969. Puzo and Francis Ford Coppola won their first joint Oscar for best adapted screenplay. Robin Moore's non-fiction book The French Connection: A True Account of Cops, Narcotics, and International Conspiracy tells the real-life story of two New York City Narcotics Detectives and their attempt to uncover a notorious drug ring. The film adaptation starred Gene Hackman and Roy Scheider as the NYC cops. A biography of General George S. Patton, this epic war film was based on not one, but two non-fiction books. Patton: Ordeal and Triumph by Ladislas Farago and A Soldier's Story by Omar Bradley were the inspiration for Patton. The film won seven Oscars. Best Pictures from the 1970s also included The Deer Hunter (1978), Annie Hall (1977), and Rocky (1976). Based on the 1965 novel Midnight Cowboy by James Leo Herlihy. Jon Voight played the role of tortured Texan Joe Buck, a 'Midnight Cowboy'. Oliver as in Oliver Twist, Charles Dickens most beloved orphan. 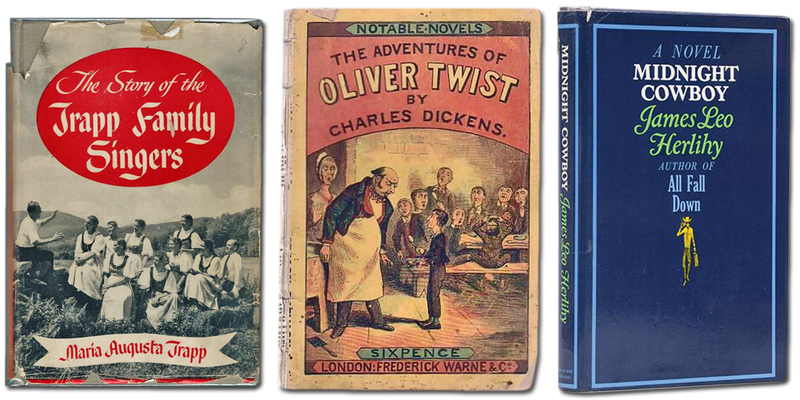 First published as a serial in the 1830s, Oliver Twist was Dicken's second novel. Anyone who has seen this classic film should recall Sidney Poitier's line, "They call me Mr. Tibbs." Poitier portrayed Virgil Tibbs, a black police officer passing through Wells, South Carolina during the height of the civil rights movement and the main character in John Ball's 1965 crime novel, In the Heat of the Night. Winner of six Academy Awards, this film was adapted from Robert Bolt's biographical play about Sir Thomas Moore, titled A Man for All Seasons. Bolt wrote the screenplay himself, winning the Oscar for best adapted screenplay. As fictional as the musical Trapp family might seem, The Sound of Music was inspired by Maria von Trapp's memoir, The Story of the Trapp Singers. Julie Andrews was nominated for her portrayal of Maria but the Best Actress Oscar went to Julie Christie for her role in Darling. Based on George Bernard Shaw's play Pygmalion, My Fair Lady starred Audrey Hepburn as the lovable Eliza Doolittle with the Cockney accent and Rex Harrison as the phonetics professor who aims to break it. The film won eight Oscars, including best costume design to Cecil Beaton. No, not the singer. This Tom Jones predates the crooner by about two centuries. Based on the 1749 novel The History of Tom Jones: A Foundling by British writer Henry Fielding, the film won four Oscars. The film adaptation of the Broadway musical based on William Shakespeare's tragic romance, Romeo and Juliet. The movie won an outstanding 10 Academy Awards, winning in all but one of the categories it was nominated in. We can't forget Best Picture winners Lawrence of Arabia (1962) and The Apartment (1960). Based on Lew Wallace's 1880 historical novel Ben-Hur: A Tale of the Christ, the film starring Charlton Heston as Judah Ben-Hur was nominated for 12 Oscars and won 11. The book was the bestselling novel of its time and remained so until the release of Gone With the Wind decades later. Screenwriter Alan Jay Lerner transformed Gigi, Colette's 1944 novella about a young Parisian girl being groomed to become a courtesan, into a musical romantic comedy that was nominated for nine Oscars and won them all. Based on French novelist Pierre Boulle's historical novel The Bridge Over the River Kwai (originally written and titled in French, Le Pont de la Rivière Kwai). While fictional, Boulle based the novel on his own personal experience. Boulle was awarded the Oscar for best adapted screenplay, but it truly belonged to writers Michael Wilson and Carl Foreman who were blacklisted for belonging to the Communist Party at the time. Wilson and Foreman were awarded posthumous Oscars in 1985. This technicolor adventure film is based on Jules Verne's famous novel Around the World in Eighty Days, originally published in French as Le tour du monde en quatre-vingts jours in 1873. 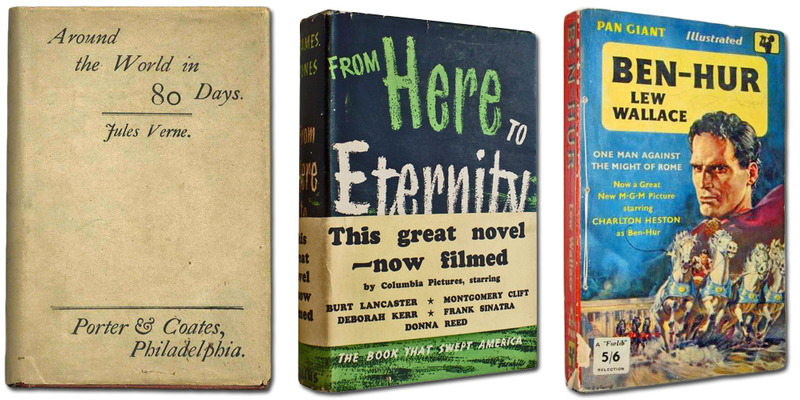 Based on James Jones' first novel, From Here to Eternity, the film starred Burt Lancaster, Frank Sinatra, and Donna Reed. From Here to Eternity is set in Hawaii during the months leading up to the attack on Pearl Harbor. The film won eight Oscars. All About Eve was inspired by a short story that appeared in the May 1946 issue of Cosmopolitan magazine. The story was titled The Wisdom of Eve and was written by Mary Orr. The author was never given screen credit for the film that starred Bette Davis and won six Oscars. Best Pictures from the 1950s also included Marty (1955), On the Waterfront (1954), The Greatest Show on Earth (1952) and An American in Paris (1951). Adapted for film from the Pulitzer Prize-winning novel All the King's Men by Robert Penn Warren, the political drama stars Broderick Crawford as the ruthless politician Willie Stark. Sir Laurence Olivier was no stranger to Shakespeare, portraying Henry V, Richard III, Othello and, of course, Hamlet. He acted in and directed Hamlet, earning Oscar nominations for both but winning only the Best Actor award. A controversial film noir, this movie was based on Laura Z. Hobson's novel A Gentleman's Agreement. 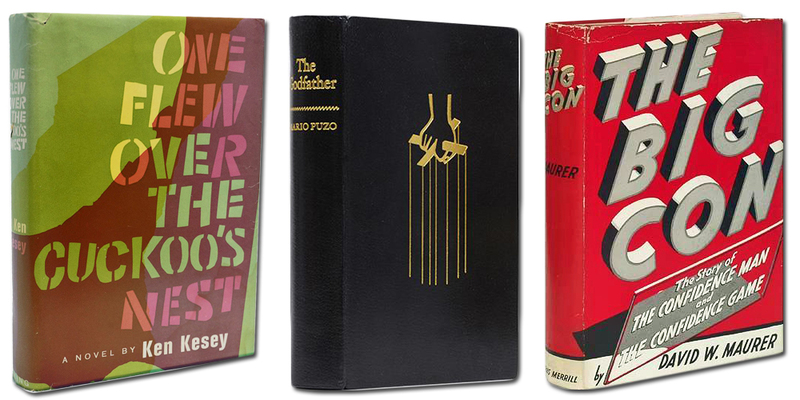 The book was originally published as a serial in Cosmopolitan magazine in 1946 - by 1947 it was a bestselling novel. Gregory Peck starred in the film adaptation, playing the role of Philip Green, a journalist tasked with writing about anti-Semitism in New York. The Best Years of Our Lives was inspired by the work of war correspondent MacKinlay Kantor who published his work as a novella titled Glory for Me. Robert E. Sherwood adapted Kantor's work for film. It won eight Oscars. Based on the semi-autobiographical novel The Lost Weekend by Charles Jackson, published in 1944. It's the story of Don Birnam, an alcoholic writer who goes on a days-long binge. Ray Milland won an Oscar for his portrayal of Birnam. Leo McCarey wrote a short story titled Going My Way. Later, he adapted the story for film. The movie won seven Oscars - McCarey took home two for directing and writing. The literary inspiration for the film was Mrs. Miniver by Jan Struther. Originally published as a newspaper column in the late 1930s, Mrs. Miniver is the story of a British housewife and her transition from dull domestic routines to wartime. The film won six Oscars including best actress for Greer Garson who played the title character. How Green Was My Valley was written by Richard Llewellyn and published in 1939. It tells the story of the Morgan family, miners living in South Wales. The film was nominated for 10 Oscars and won five. Maureen O'Hara starred. 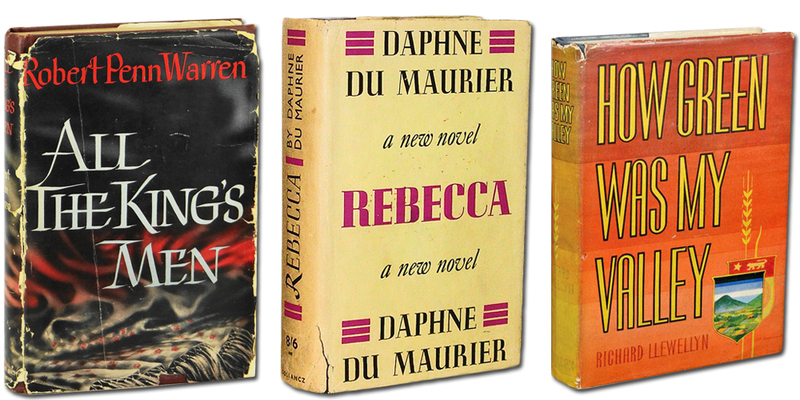 Based on the bestselling gothic novel Rebecca by Daphne du Maurier, the story of a young woman who finds herself in a marriage haunted by a deceased first wife. While the film was nominated for 11 Academy Awards, it won only two. Casablanca (1943) was the only Best Picture winner of its decade not based on a book. Margaret Mitchell is far from prolific, but her historical romance Gone With the Wind is arguably one of the world's most famous novels, certainly thanks to the Oscar-winning film adaptation that starred Clark Gable as Rhett Butler and Vivien Leigh as Scarlett O'Hara. The film won 10 Academy Awards. The Pulitzer Prize-winning play You Can't Take it With You by George S. Kaufman and Moss Hart hit Broadway in 1936. The play, about an eccentric New York City family, was the basis for the film that won two Oscars. The story of legendary French author Émile Zola (1840-1902), The Life of Émile Zola is based on Matthew Josephson's biography Zola and His Time. The 1932 novel Mutiny on the Bounty by Charles Nordhoff and James Norman Hall is a fictionalized tale about a real life event - a mutiny on board a navy vessel while on a mission in the Pacific in 1789. The Oscar-winning film is one of many adaptations of the 1932 novel. Based on the short story Night Bus by Samuel Adams, It Happened One Night won all five major Academy Awards. Clark Gable and Claudette Colbert played two unlikely lovers who find themselves in the midst of a whirlwind adventure. Spanning 30 years, Cavalcade is a look at British life through the eyes of the wealthy Marryot family as they endure major events including the death of Queen Victoria, the sinking of the Titanic, and World War I. The film was based on the musical play Cavalcade by English playwright and composer Sir Nöel Coward. 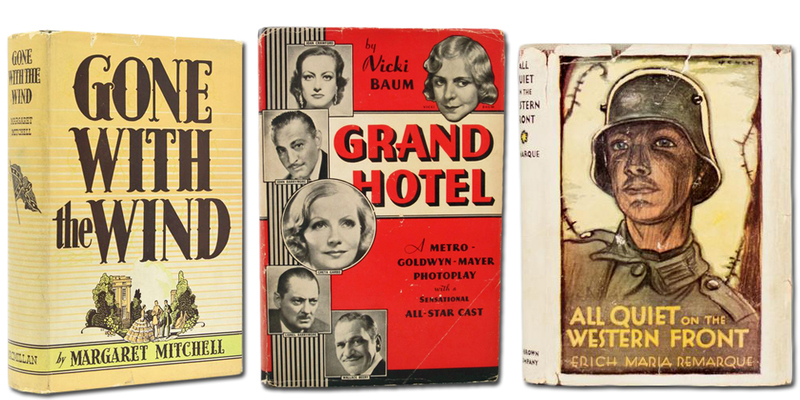 Greta Garbo starred in the film adaptation of Grand Hotel by Vicki Baum, a story about the comings and goings of the guests and residents at Berlin's Grand Hotel. In fact, the book was originally published first in German as Menschen im Hotel. A tale about Oklahoma after the Land Rush of 1889, this Oscar-winning western is based on Cimarron by Pulitzer Prize-winning author Edna Ferber. While she started out writing romance, Ferber produced famous works including So Big (for which she won the Pulitzer) and Showboat. Written by German soldier Erich Maria Remarque, All Quiet on the Western Front was originally published as Im Westen nichts Neues and gives a soldier's harrowing account of warfare. The Great Ziegfeld (1936), The Broadway Melody (1928/29) and Wings (1927/28) were the only Best Pictures from the '20s and '30s not based on literature. What are your favorite books-turned-movies?